Located in the mountainous northwestern part of Vietnam, Sapa is a beautiful town with spectacular natural landscapes and rustic people. 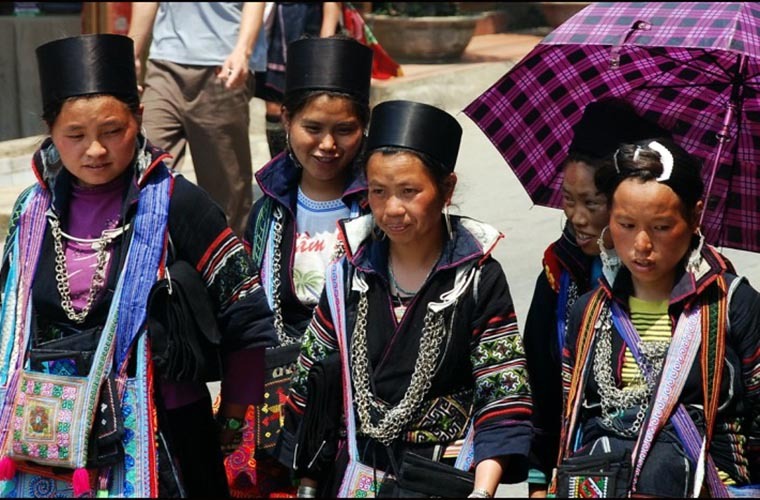 Specifically, Sapa is very famous for its diverse culture with a huge number of ethnic minorities living in this area. Amongst these ethnic minorities, Black H’mong, Red Dao and Giay are the three most outstanding groups with high proportion of people and unique traditional cultures. H’mong is the largest group in Sapa Vietnnam which accounts for about 53% of people living here. In the past they used to live along Yangzi river (China) and were very good at rice cultivation. Because of a conflict with the Hans, most of them migrated to the South and splitted into small groups. 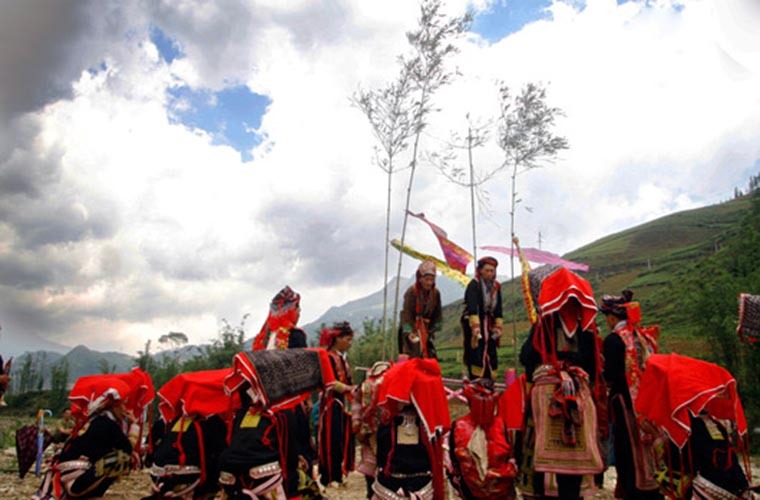 300 years ago, the earliest Hmongs set foot on Sapa and they mostly gathered at Hoang Lien moutain range. Despite the harsh conditions with rugged terrain and lack of fertile soil, they managed to cultivate rice with experiences handed down from generation to generation. 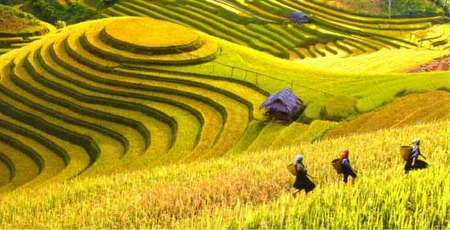 They leveled down the mountain sides, hillsides to make unique terraced fields in which people can grow and harvest rice or corn twice in one year. H’mong people living in Sapa are Black H’mong as their costumes are all in black. Noticeably, their costumes are totally different from those of Black H’mong living in other areas so people often call them Sapa H’mong. H’mong men usually wear black or indigo pants, short sleeve shirt covered with long tail waistcoat. Their traditional hat is a small round hollow one that barely fits the sinciput. Most of them are in black, some are decorated with colorful embroidered edge. Men’s hats are even sewed up with colorful bands or coins. H’mong women also wear black costumes. They wear a black turban with vertical rim like paper rolling high up above the sinciput. Outside is a sleeveless long tail coat that resembles those of men. People squeeze beeswax to make these coat and as a result, they have silvery black color. Especially, H’mong women wear shorts down to knee instead of skirt. They skillfully wrap a tiny band around the edge. Of all the traditional festivals, Gau Tau festival which takes place in 12th of January is the most spectacular festival of the H’mong. In this festival there are several interesting contests such as archery, crossbow shooting, pan-pipe dancing, martial art performing and horse racing contest. CatCat village of SanSaHo commune (2 km away from Sapa town), Sa Pa, Lao Chai, Seo Mi Ty and Ta Giang Phinh communes are the most crowded village that H’mong people live in in Sapa Vietnam. 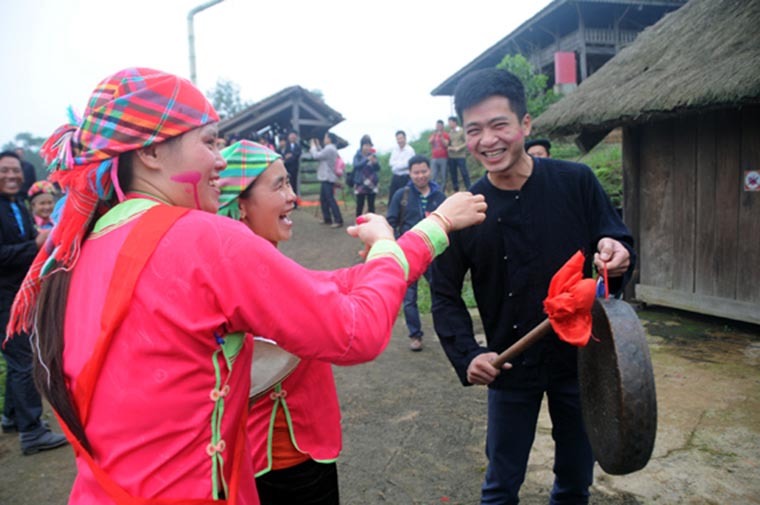 Tourists will have a chance to directly observe their daily life, try ethnic’s specialities such as horse’s internal organs soup, chicken’s blood and cooked meat, corn wine, frog boiled with bamboo shoot, corn cake and fermented Tofu. 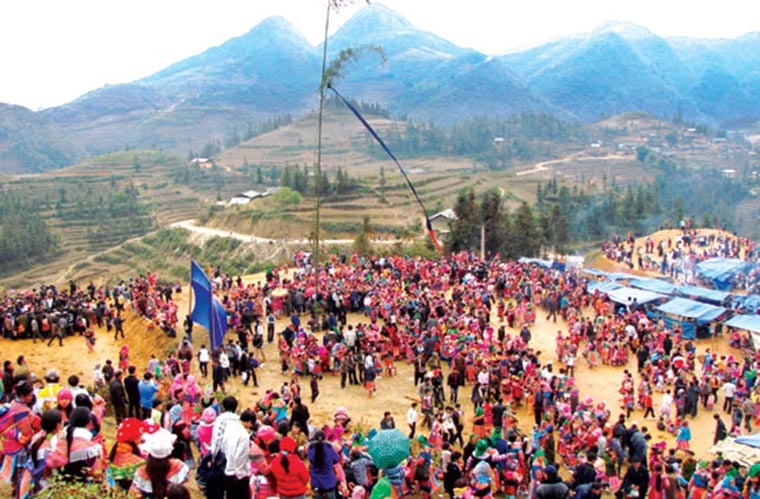 Red Dao is the second largest group of ethnic in Sapa, right after H’mong. They share the same root with H’mong as they originally came from Yunnan (China). 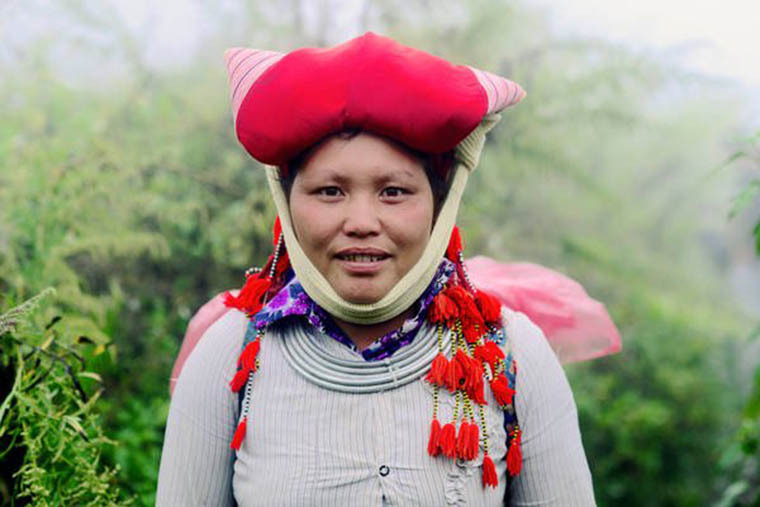 Red Dao is a small group of Dao minority immigrated into Vietnam from XIII century to the 40s of 20th century. 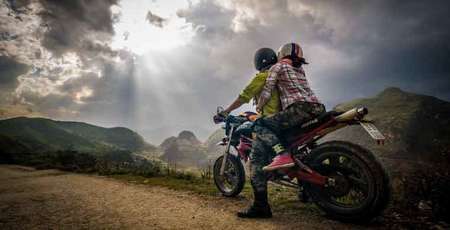 They predominantly live in Ta Phin, Nam Cang, Thanh Kim, Suoi Thau and Trung Chai communes. 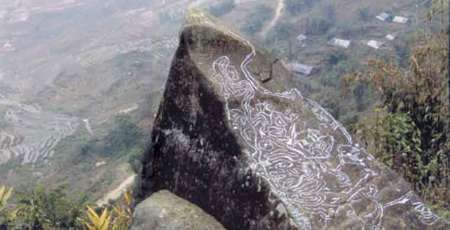 According to scientists, they have close relationship with the H’mong. They were once regarded as having the same origin but each has their own distinctive features. 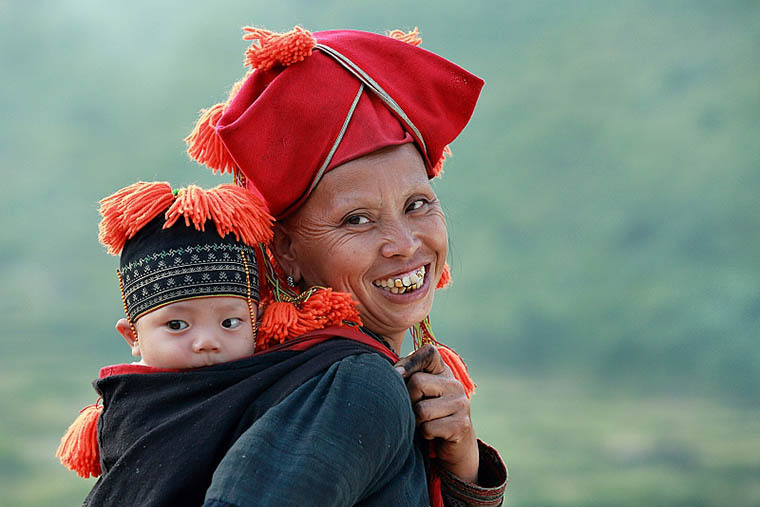 Nowadays, when coming to SaPa Vietnam, tourists can easily figure out the differences in their costumes, daily activities though both H’mong and Dao people live together in a community. 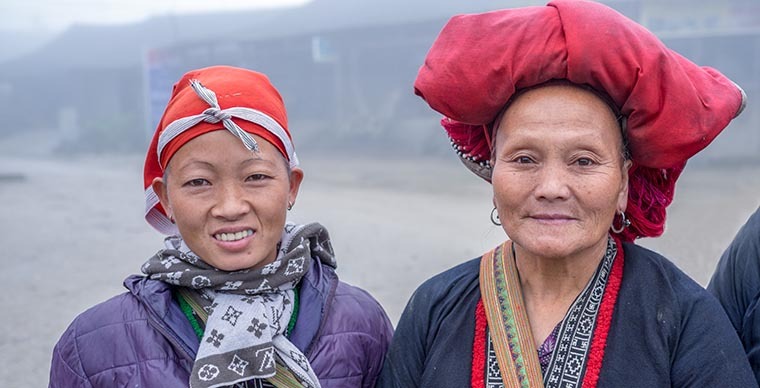 While H’mong people often choose to live in high places in the mountain, Dao people prefer living in the valley or half-part of the mountain to cultivate corn, rice and black cardamom. There are several groups of Dao people living in Sapa but they are mainly Red Dao. 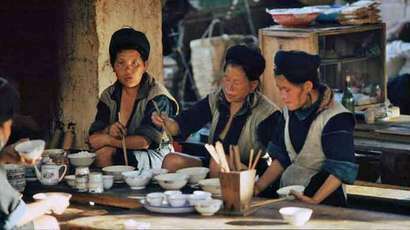 Red Dao women usually wear red hat or turban, indigo color shirt with red and white pattern in colar, lap and bottom of the dress. Their costumes are considered the most beautiful outfit in fairs in Sapa. Women have custom of shaving eyebrows and part of their front hairs as they thought that it will make them look more beautiful. They also have their own writing based on the acient writing of Chinese called Nom – Dao writing. Unfortunately, until now only the elderly can read and understand this writing. Dao people believe that dog is their ancestor so dog is alway highly appreciated. Dao men can only be considered adult if they have gone through the certifying ceremony. Touching children’s head is a taboo, whenever they cut or shave their hair, the hair on the sinciput part will be kept as they think that it is the place where human’s soul are kept. By keeping the hair on top children will be protected from illnesses. They also believe that before getting married girls and boys are not allowed to take picture together beacause it is a bad omen. This is strictly forbidden for Dao women. If you want to take picture of them you had better asking for permission first. 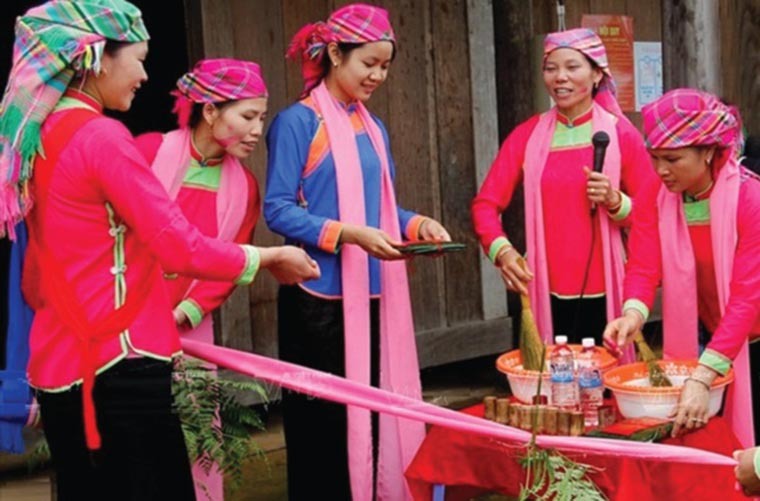 Dao minority also has their own amazing festival such as dancing Tet held in 1st and 2nd of January, exchanging sentence festival in 10th of January in Ta Phin village, a small village 12 km away from Sapa town, where both H’mong and Dao people live. 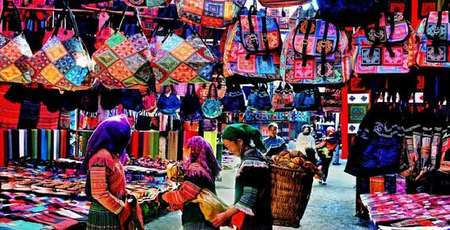 This village is famous for beautiful brocade that is various in size and color made by skillful H’mong and Dao women. Remarkably, bath with medicinal herbs handed down from Dao’s ancestor is very good for tourists who has gone through a long trip. 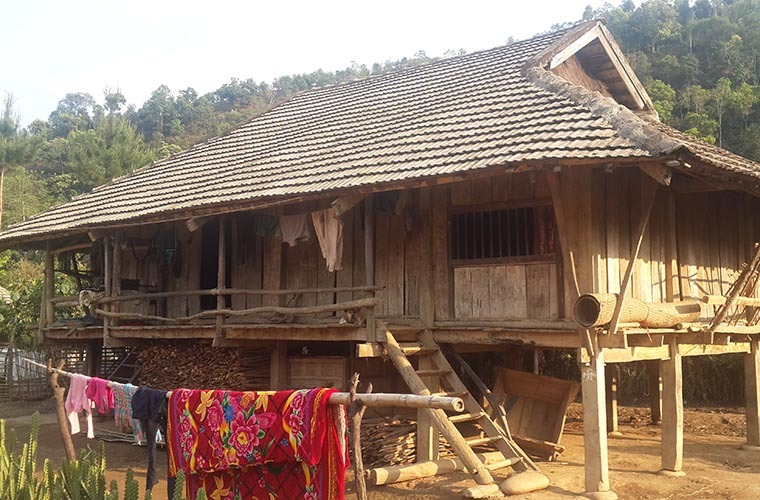 Giay minority is a small branch of Tay – Thai minorities, they predominantly live in the northernmost mountain areas. 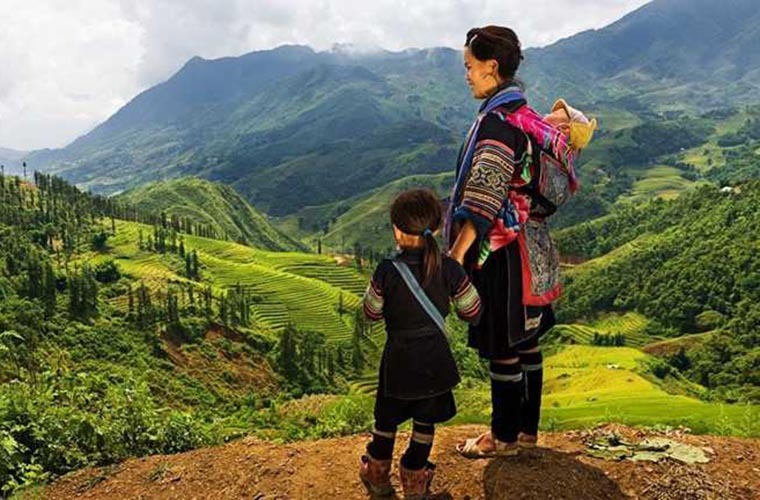 It is estimated that there are about over 25.000 Giay people in total and in Sapa Vietnam there are only 2% of this number gather in villages around TaVan, LaoCha valley. Just like Tay, Nung and Thai people, Giay people guard on flat paddy fields that are used to grow non-glutinous rice where in the past they only cultivate once per year. 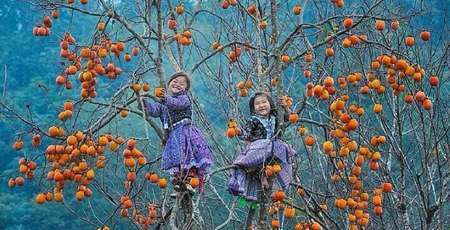 In January after Tet holiday, they hold festival to mark their first step on the field of the year which symbolizes their wish for an abundant crop in new year called “Giong Pooc”. In the village they help each other by exchanging their works in busy occasions such as transplanting season and harvesting time. Besides, they also raise poultry and cattle like chicken, duck, buffalo, horse and so on. Giay’s costume is much simpler than other ethnic groups with only colored bands in the colar and lap of the dress and less patterns. Giay people in Sapa Vietnam live in house with soil ground, wooden walls, entresol with altar in the middle as well as the living room. They own a number of folk-songs, proverbs, riddles, especially there are numerous legends explain about both social and natural phenomenons. Their folk-songs are used all in social activities such as funeral, wedding ceremony, festival and notably in exchanging sentences between man and woman.